After several weeks of waiting my Cubieboard arrived. It was sandwiched in a numerous of layers of packing tape as if to prevent me from opening Pandora’s Box. After shedding the layers of tape and mounting the device into its acrylic case it was time to get down and dirty. The device didn’t come with a dedicated power supply only a USB to coaxial female jack that required the use of an adequate power source such as an iPad power cube or properly powered USB hub. After connecting a USB keyboard and mouse along with a separately purchased HDMI cable the crescendo was quickly approaching. As power surged into the board, the thought of Dr. Emmett Brown sliding down a power cable attached to the Hill Valley clock tower in the nick-of-time to send Marty McFly back to the future flashed through my mind. The board came to life with bright red and green LEDs, the monitor switched to active from standby and then with a brief Android boot logo the device halted and the screen went dark. It was as if time had ended and the warm glow of the screen was snuffed in its prime. The device was supposed to come preloaded with a highly stable Android image and hold the promise of running more powerful Linux operating systems. As you can imagine my first time Cubieboard experience was highly disappointing. Keep in mind there is no documentation that comes with the device either. The various support forums for the device were filled with users with similar issues and solutions were looking grim. I realized that the NAND storage on the device needed to be rewritten, however; it would require the use of half-baked tools which only work in 32bit Windows via unsigned drivers that don’t always work and PDF documentation not in English. 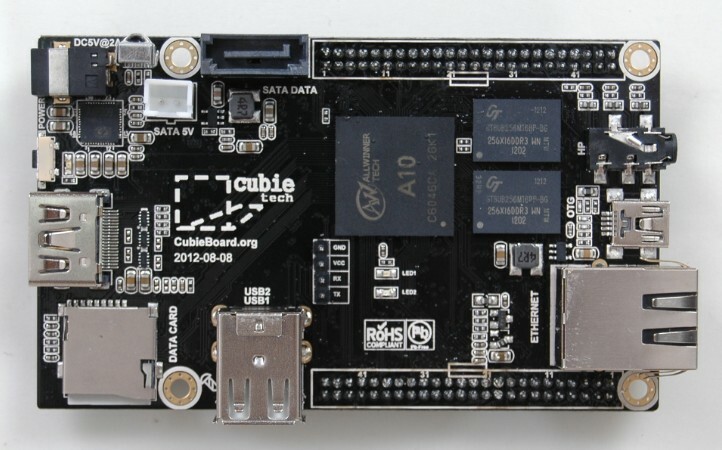 The Cubieboard site provides links to various NAND images for use with LiveSuit, a tool to write the images to the onboard flash memory. After some time using a Windows XP virtual machine, the Cubieboard was re-imaged. It should be noted that LiveSuit 1.09 was used to perform the imagining and that version is not found on the Cubieboard web site. Finally the device booted fully, however; screens which do not support the default Android resolution will get a black screen after clicking in the UI. I would recommend using the device on an HDTV with native HDMI and not HDMI to DVI. If the HDTV supports resolutions up to 1080p there should be no problem seeing the output. Once access is gained it is possible to modify the resolution and use the device on different displays. The next adventure will be to load a Linux image on a micro SD card or directly onto the NAND memory. Overall the device is pretty cool for the price but it’s no Raspberry Pi if you are looking for support and ease of use. These problems will most likely self-resolve as the Cubieboard project matures. Until then it’s going to be a long hard road.